When you are making plans to travel to another foreign country, you have to take into account many things. Starting from whether you will be allowed to enter the country to where you will be staying and for how long. If you are coming from a country which does not have a lot of free movement in foreign countries, then you will most likely need a visa. This is the case for many non-EU nationals who want to enter the EU or Schengen zone countries. These people will need a Schengen visa to enter any of the participating countries. But getting a visa is a long process and you as an applicant will need many documents and steps to get it. One of the most important things you have to prove though is that you will not stay illegally in any of the Schengen zone countries. Because of this, having an invitation letter for the Schengen visa is extremely beneficial and will help your application a lot. This article will go through the invitation letter details, its types, and provides visa invitation samples. What is an invitation letter for visa? So in case you do not return to your home country within the specified time frame, the authorities will know you are staying illegally, but they will also have the contact information of the person you were staying with. That is how they can find you and take the necessary measures if you overstay your Schengen Visa. If you are planning to travel for a specific purpose to the Schengen area countries, you must make sure that you have an invitation letter. The letter will make it much easier for the Embassy grant you the Schengen Visa. What are the types of invitation letter to the Embassy? 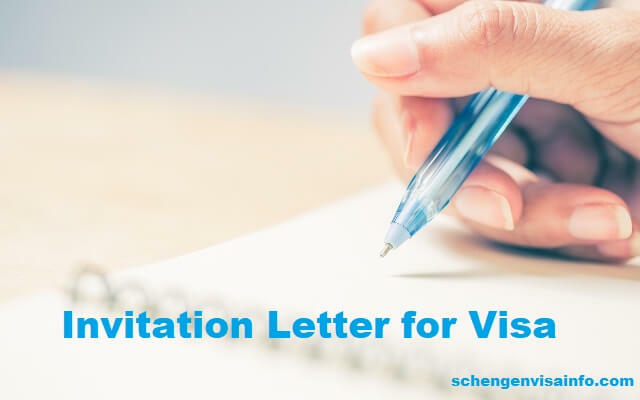 Since there are many reasons you would want to travel to a Schengen area country, there are also many types of invitation letters. Each type of invitation letter will also require additional supporting documents to prove that what is written in the letter is true. The Embassies are very particular about this and they will not take into consideration an inviting letter without documents that support its claims. Below we have compiled a list of the different types of invitation letters with descriptions of what they are and the necessary documents. One very common reason people travel to the Schengen area is to visit relatives or friends. This is also seen as a visa for tourism in the particular country. So for the invitation letter for tourist visa, family or friends must write it for you. The letter must state that you are the person’s relative or friend and that you are going to visit for a specific period of time. This letter could be from your spouse who is an EU or Schengen area national, your parents, or your children. For each one you must attach a valid marriage certificate or birth certificate to prove your relationship. If you are going to the Schengen area to study in a university or a college, you must prove that. To do so, the institution you will attend must send you an acceptance letter inviting you to join them. The letter must have all the details of your stay there, including your major, the duration of your studies, how the studies will be financed, where you will stay, and so on. You might need a Schengen visa because you are having health troubles and you need treatment in a foreign country. It is not unusual for people from non-EU countries to seek medical help in Schengen countries due to the high level of development there. Writing an invitation is not a very complicated task. As long as the letter includes all the necessary information, you or the person inviting you will not have trouble writing it. Some people might choose to pay someone, such as a visa expert or lawyer to write this, but it should not be necessary. To be able to write a good invitation letter, you can follow the tips below. In addition to the necessary information and documents, you must also use formal language in the invitation letter. You must show that you understand the Embassy’s importance and you respect their authority. The letter of invitation cannot use colloquial language or any local expressions or metaphors. The letter must be straightforward without any embellishments, so as to demonstrate a serious intent to visit the country and also return to your home country. To show how this could be phrased, we have included samples of invitation letters below. The purpose of the visit of my friend, [Applicant’s Name] is to visit me and engage in tourism in [Country’s Name]. Our long standing friendship has endured distance and time, and we have wanted to use the visit of my friend to reconnect and share old memories. During the specified trip dates above, we will be visiting [Specify city/place names]. In addition, [Applicant’s Name] will be staying at [Provide Inviting Person’s Address or Hotel Address]. The trip will be funded through [Provide means of funding]. Note: The above visa letter samples may also be used for USA visitor visa and other country visas as well.